Bronze ceremonial cat produced, Egypt. Bronze, lost-wax cast, founders unknown. Order of the Hospital of St John founded, Jerusalem. Later to be known as the Knights of Malta / Knights Hospitaller. It might be a Scottish name, taken from a story about two men on a train. Knights Hospitaller settle on, and take stewardship of, Malta, Gozo and Tripoli, by arrangement with Emperor Charles V of Spain. Payment for lease set at one Maltese falcon p.a. Knights of Malta forge a jewel-encrusted golden falcon as their first tribute to the King of Spain. However the falcon (hereafter referred to as ‘The Maltese Falcon’) is taken by pirates before arrival in Spain and carried to Algiers, most likely by the buccaneer Khair-ed-Din. The Maltese Falcon is spirited to Sicily by Sir Francis Verney, an English adventurer who briefly took up with the buccaneers working from Algeria. 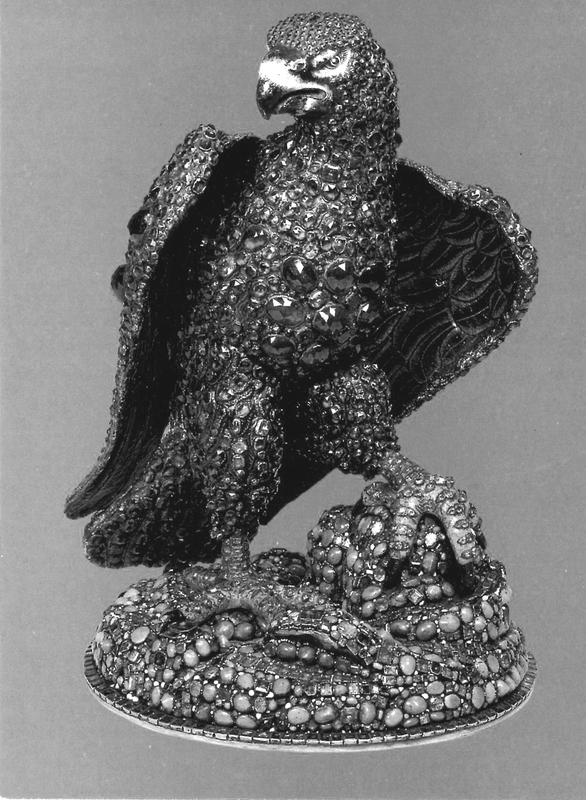 In tribute to both his family and estate, Count George Wilhelm von Kniphausen of Nienort (eastern Holland) dedicates a 36.5cm tall, jewel-encrusted and highly elaborate ceremonial pouring vessel in the form of a hawk. Created from silver and silver-gilt, painted enamel and set with garnets, citrines, amethysts, sapphires, turquoises, emeralds and onyx cameos its style is typical of German designs from the latter half of the 17th Century. The bird, known as the ‘Kniphausen Hawk’ was to disappear from Nienort in the early 18th Century. The Falcon recorded as in the possession of Victor Amadeus II (previously King of Sicily, latterly of Sardinia), forming part of his marital tribute postabdication, then returning with the couple to Turin the following year. Storia del regno di Vittorio Amadeo II, Carutti, D, Torino, 1856. Following the conquering of Naples by Charles III of Spain (the Duke of Parma) the Falcon reportedly falls into the family of Don José Moñino y Redondo, who would later serve as Charles III’s chief minister. At the cessation of the first Carlist War the Falcon followed the many Carlists who sought refuge in Paris. To ensure safe transit during the troubles the statuette by this stage had been painted or enamelled in black, disguising its true value. A Mr Chad, based in Brussels but working through a dealer in the Hague, is on record having sold an ‘eagle’ to William Cavendish, the 6th Duke of Devonshire. It has been suggested that this invoice concerns the transfer of the Kniphausen “Hawk”, purchased for the sum of £105. Treasures of Chatsworth, a Private View, The Duchess of Devonshire, London, 1991. The 6th Duke of Devonshire loans the Kniphausen “Hawk” for public display in the Netherlands Department of the Great Exhibition of 1851, held in the recently erected Crystal Palace in London. This temporary structure was designed by the head gardener and greenhouse designer from Chatsworth, Joseph Paxton. Victoria and Albert paid several visits to the home of the 6th Duke through the 30s and 40s. Subsequent to exhibition the Hawk takes its place in the Devonshire family collection, currently housed at Chatsworth House, Derbyshire, family seat of the Devonshires, Its whereabouts during the 1700s remains a mystery. 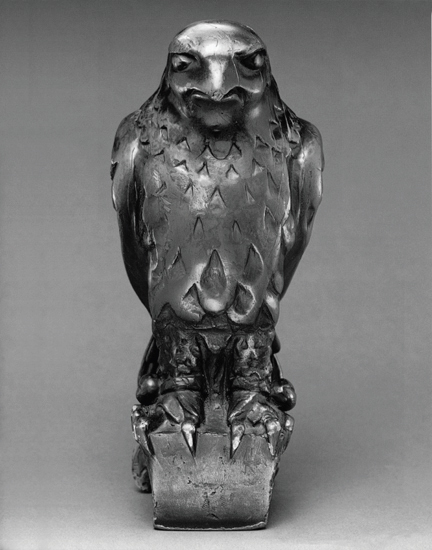 The Maltese Falcon is identified and acquired by Charilaos Konstantinides, a Greek dealer in antiquities in Paris. Following his own research into the statuette, it is re-enamelled under his instruction. Konstantinides’ Paris establishment is burglerised and the Falcon taken, whereabouts unknown. The Maltese Falcon is located by Kasper Gutman, speculator, in the possession of a General Kemidov, originally of Russia, in Constantinople. Having failed to negotiate a deal for the statuette, it is subsequently stolen-toorder. The statuette that is shipped, via Hong Kong to San Francisco, is now understood to be the first known duplicate made of the artifact, presumably by General Kemidov, cast in solid lead and enamelled black. 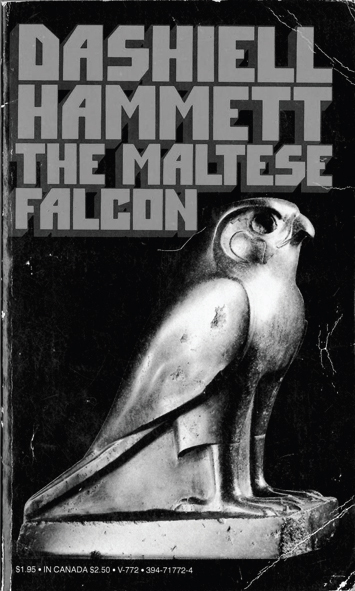 The first book on the subject of the statuette known as the Maltese Falcon is published by Alfred Knopf (New York, 1930), written by Dashiell Hammett. A prototype forgery is attempted shortly after publication (1931). This 1972 Vintage printing shows an alternative visual inspiration for the statuette. Robert Grenville ‘John’ Gayer-Anderson, then resident in Cairo following retirement from the British army, collector of antiques, is offered a bronze pharonic statue of a cat by an unnamed associate. Although covered in dirt and mineral deposits it’s value is immediately apparent. He embarks upon the object’s restoration personally. Gayer-Anderson is allowed to take stewardship of and occupy the Beit el-Kritliya (‘house of the Cretan woman’), two adjoining properties dating from 1540 and 1632 renovated by the Egyptian government, on condition that the house and his collection of antiquities would be handed to the Egyptian government on his death or departure. 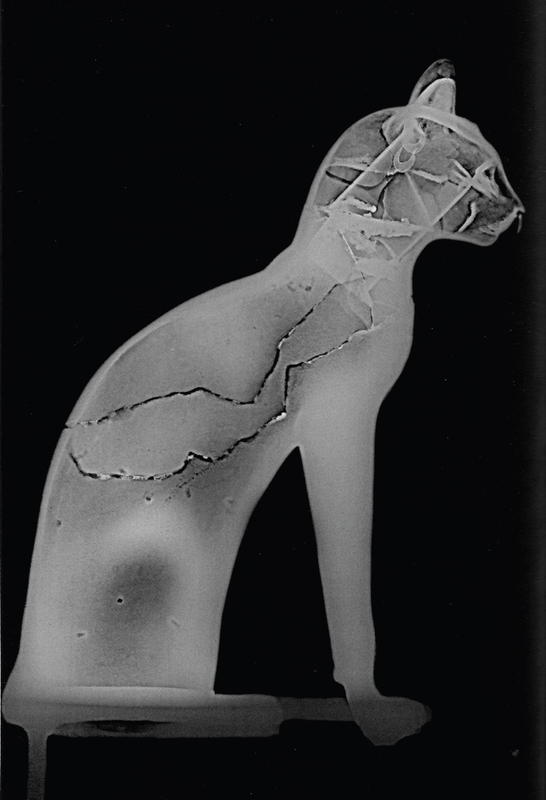 The first replica of the cat is made, in Cairo, by John Gayer-Anderson. At some point this year the original statuette is boxed and sent to the UK, care-of a close friend of Gayer-Anderson, Mary Stout. It is sealed and stored in the vault of a branch of Lloyds Bank in Lavenham, Suffolk. The original statuette is further offered to the British Museum on Ms Stout’s demise. Negotiations regarding terms of the donation continue until 1946. 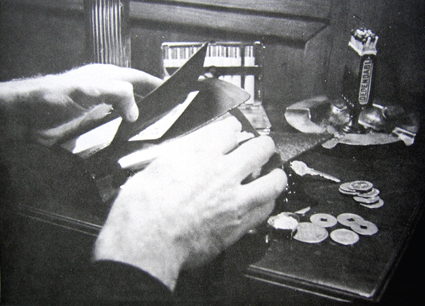 Three further replicas are produced of the original counterfeit in California by artist Fred Sexton, on commission from Warner Brothers film studio. At 11.5inches tall, two are cast in solid lead (weighing 47 pounds each), one in a composite resin (weighing 4.54 pounds). The replicas are hallmarked ‘WB 90066’, ‘WB 90067’ and ‘WB 90456’ respectively. These three similar statuettes become the models for all subsequent duplications. Of these three counterfeits, one lead statuette (WB 90066) is given by studio-head Jack Warner to the actor William Conrad. The other two disappear from view. 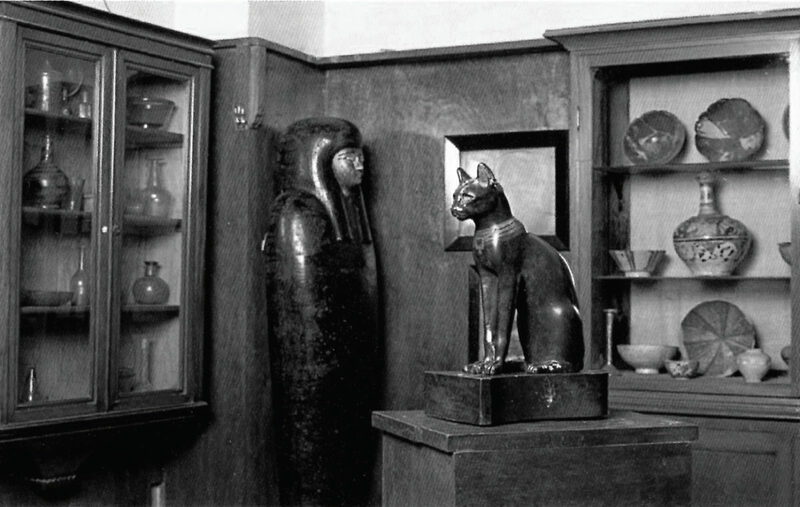 John Gayer-Anderson leaves Egypt, leaving a copy of the cat statuette in place in the Museum Room of the now-renamed Gayer-Anderson house. The house and the remaining collection of antiques and artifacts is bequethed, as arranged, to the Egyption government. John Gayer-Anderson dies, leaving his twin brother Thomas the executor of his will. The cat statuette is moved from Lavenham to the Gayer-Anderson’s London solicitors. 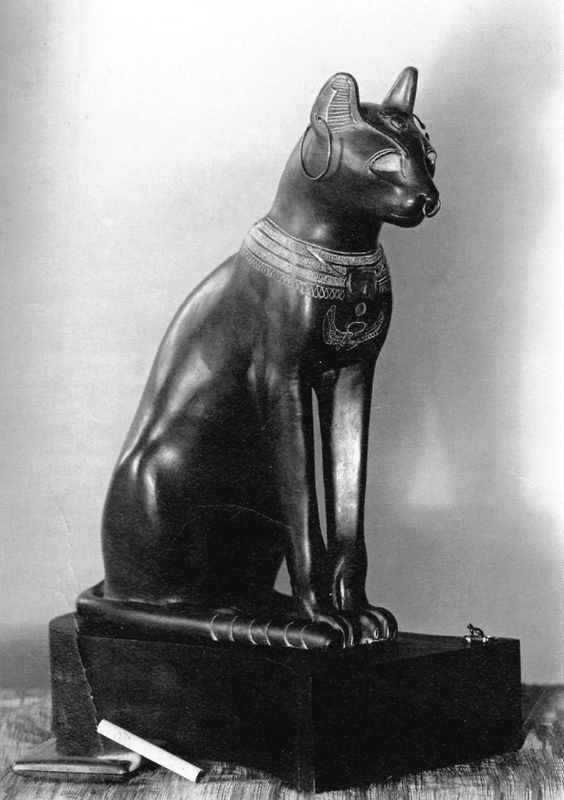 The British Museum takes possession on the 20th August and the ‘Gayer-Anderson Cat’ is subsequently put on display in the Egyptian galleries. Ken Patterson establishes ‘The Haunted Studio’, a company producing replicas of the replica Falcon and similar artefacts. Founded in Los Angeles, the company is now based in Northern Minnesota. 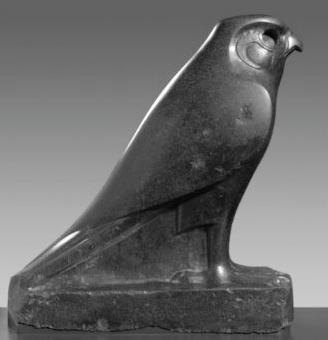 8-pound copies of the Falcon cast in gypsum (under the trade name ‘Ultra-Stone’)and painted black remain their most successful product. They also represent the most widely available mass-produced reproduction. This company is just one of a number of similar enterprises formed since the a film in 1941 documented the ‘original’ copy. Most manufacturers incorporate their own, often highly dubious historical provenance in promotional literature, though none are believed to be cast from the same mould as the statuette documented in 1941 and are therefore often poor imitations. A number of secondary forgeries also emerged following the production of a second film referencing the original Falcon in 1974. Two versions likely produced for this production were also subsequently stolen – one from the Los Angeles County Museum of Art in 1974, the second from John’s Grill (San Francisco) in 2007. Surrey County Council negotiate the transfer of Little Hall, Lavenham to the Suffolk Building Preservation Trust. In 1978 it is opened to the public. Housing many of the objects and artifacts collected by the Gayer-Andersons, the museum also houses one further bronze cast of the cat statuette, most likely produced in 1939 or before, and gifted to John’s twin brother Thomas (d.1960). Minor repairs to imperfections on the surface of the original bronze are conducted to allow for a casting-quality mold to be taken. Subsequently the British Museum Company Limited, established and owned by the Trustees of the British Museum, are licenced to produce resin and bronze replicas for general sale. The Beverly Hills based collector Dr Gary Milan, a former dentist, is offered a copy of the original counterfeit Falcon under unclear circumstances. Subsequently exhibited in galleries and now on longterm loan to the Warner Brothers Studio Museum, this lead copy is identified as the 1940 statuette hallmarked WB 90067. A resin copy of the original Falcon counterfeit is ‘discovered’ by film producer Ara Checkmayan at the Golden Nugget flea market, New Jersey. After extensive technical research based on original photographs of the replica taken in 1940, it is established that the statuette is the resin copy hallmarked ‘WB 90456’ produced at the same time as the second-generation lead copies. Its identity is established in 1995. The resin Falcon has a chequered auction history from this point on, being offered to sale several times and being withdrawn twice as provenance concerns persisted and in 2008 failing to reach its reserve. It sold in 2000 for $92,000 and most recently on September 24th 2010 at Guernsey’s auction house, New York for $305,000. A consortium of buyers, including actor Leonardo DiCaprio and pharmaceutical billionaire Stewart Rahr, purchased the resin Falcon WB 90456 from the collection of property developer Anthony Pugliese. The lead Conrad Falcon (WB 90066) comes to auction on the death of its owner, actor William Conrad. It is sold at Christies Auction House for $398,000 to Ronald Winston, chairman of Harry Winston jewellers. He begins his own work to copy the Falcon. Ronald Winston sells WB 90066 to an unknown buyer. The same year, Harry Winston jewellers unveil a 10-pound solid 18K gold bejewelled version of the Falcon. Made to scale from the lead version, it stands at 11.5ft on it’s malachite base, has ruby eyes and a 42.98 karat pear-shaped diamond hangs from its beak. 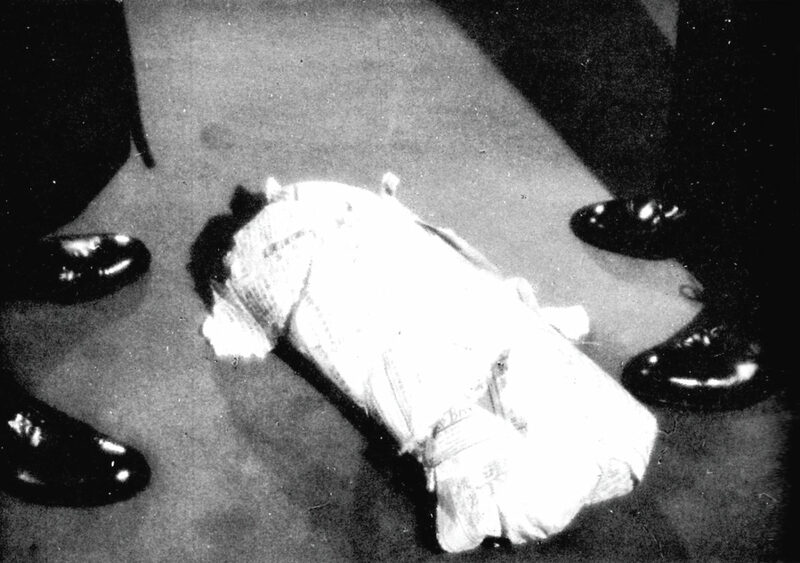 This copy is subsequently visible during the staging of the 69th Academy Awards. It is valued at over $8 million. Robert Bork, right-wing Constitutional scholar and Supreme Court nominee under Ronald Reagan, is interviewed on Channel Four News (UK). 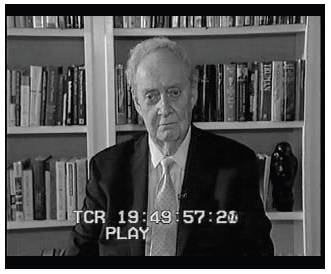 An outside broadcast, Bork’s responses are recorded in his Ann Arbor (US) study. 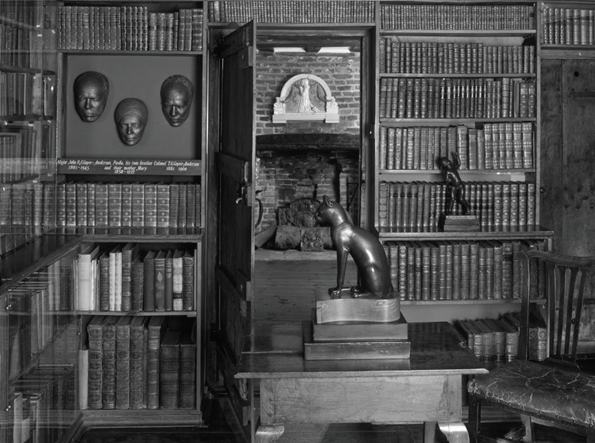 Behind him, on the bookshelves housing his library, the distinctive silhouette of a Maltese Falcon is visible.